As the Federal Communications Commission prepares to vote on a net neutrality plan, Republicans in Congress are scrambling to allege that President Barack Obama had an outsized influence on the agency’s proposal. FCC Chairman Tom Wheeler unveiled last week his plans for the future of net neutrality – a concept that calls for all internet traffic to be treated equally – and promised "there would be no rate regulation, no tariffs, no last-mile unbundling” involved. The plan, to be voted by the FCC’s five-member commission on Feb. 26, would let data delivered over broadband internet be regulated under Title II of the Communications Act, similar to how traditional telecommunications are governed already under law. Obama is among the advocates who, ahead of Wheeler’s announcement, urged the chairman to embrace a plan that evokes Title II to protect net neutrality. Wheeler’s plan hues close to Obama’s stated priorities, which recently led Republicans in Congress to demand of the FCC chairman all communications and interactions regarding the net neutrality between FCC personnel and the White House. Last week, House Oversight and Government Reform Committee chair Jason Chaffetz wrote to Wheeler about any possible undue influence the White House may have had on the chairman’s ultimate proposal. "Reports indicate that the views expressed by the White House potentially had an improper influence on the development of the draft Open Internet Order circulated internally at the Commission on February 5, 2015," Chaffetz, a Republican from Utah, wrote in demanding the FCC supply Congress with documented records of its dealings with the White House concerning the proposal. "Specifically, there are questions regarding the FCC's decision to promote the reclassification of broadband services under Title II of the Communications Act of 1934." Though the concept of net neutrality – what supporters say is a fight for free and open internet – has high support among both conservatives and liberals surveyed in recent polls, as pointed out by TechDirt, Republicans have vowed to fight any attempt to bar the likes of Comcast and Verizon from granting preferential treatment to certain online traffic dependent on payment. Many Republicans in Congress oppose the proposal, saying that government meddling would snuff out investment in the industry. “Given the significance of the matter and the strong public participation in the commission’s proceeding to date, we believe the public and industry stakeholders alike should have the opportunity to review the text of any proposed order or rules prior to commission action,” Senate committee Chairman John Thune (R-S.D. ), House Chairman Fred Upton (R-Mich.), and Rep. Greg Walden (R-Ore.) — the head of the House Communications subcommittee — said in a letter to Chairman Wheeler late last month. Last week, Thune and other congressional Republicans called on the FCC to postpone its vote on Wheeler’s proposal to allow Congress to consider a bill that would outlaw internet service providers (ISPs) from offering online “fast lanes” for higher rates and to bar the blocking or deliberate inhibition of content. The legislation, though, would not reclassify the web as a utility as Wheeler's plan does. "If the FCC goes down this path, it gets challenged, it ends up in court, (and) it chills investment," Thune said, according to USA Today. "So it not only hurts innovation and investment ... but it also clouds the picture for the future." 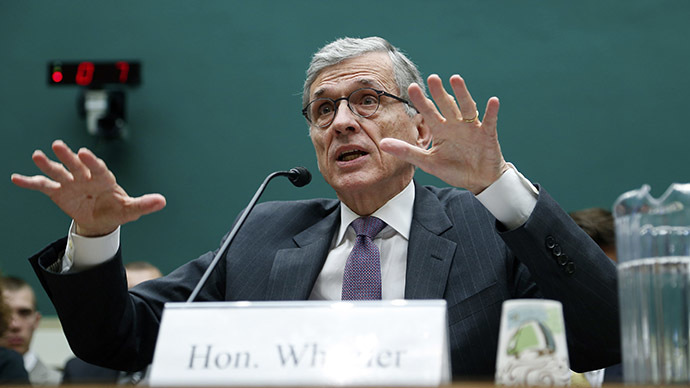 Both Republican FCC commissioners – there are three Democrats on the commission as well – have echoed Republican lawmakers in attempting to attach Obama’s brand to Wheeler’s proposal, calling it a regulatory grab by the federal government. “The foundation of the U.S. economy is for private companies to offer products and services -- not government-sponsored companies. Whether federal regulation would be of value is something I have to step back from a bit. The question is whether I at the FCC have the authority to overturn… law,” FCC Commissioner Michael O’Reilly told a conservative think tank in January. On Tuesday, Ajit Pai, the other Republican FCC commissioner, held a press conference where he declared the plan – which he is one of few people privy to at this point – could indeed mean higher fees and taxes for internet users, and price controls on ISPs. Pai said subjecting the internet to Title II of the Communications Act would allow the FCC authority to deem whether broadband prices or other practices are "just and reasonable,” an ambiguous guideline, he argued. "The claim that President Obama's plan to regulate the Internet does not include rate regulation is flat-out false," Pai said, according to National Journal. "Indeed, the only limit on the FCC's discretion to regulate rates is its own determination of whether rates are 'just and reasonable,' which isn't much of a restriction at all." Kim Hart, a spokesperson for Wheeler, said the plan "will not regulate the prices broadband service providers charge their customers,” just as the FCC has not regulated prices for cell phone companies that have had to follow Title II for two decades. "Those who oppose efforts at compromise because they assume Title II rests on bulletproof legal theories are only deceiving themselves," AT&T’s Hank Hultquist wrote. “When the FCC has to defend reclassification before an appellate court, it will have to grapple with these and other arguments,” he added.